Anshan ying yat trade Co., Ltd and anshan hongming metallurgical machinery Co., Ltd is a comprehensive group corporation.It is a large-scale company who integrates manufacturing together with trading.Our company has its own right to import and export for machineries.We have very strong technical force and numerous technical staffs.We can start from designing, manufacturing until exporting the machinery to the countries and regions where nominated by our clients. 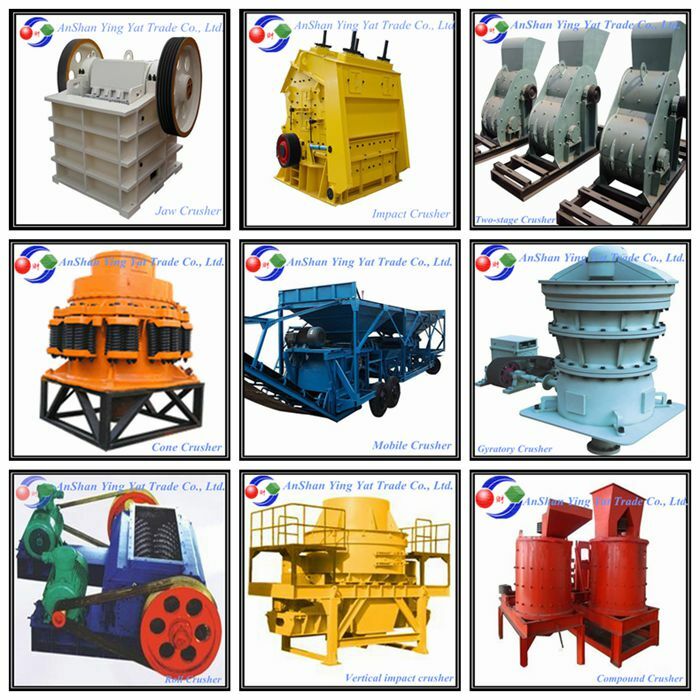 Our company is mainly dealing with various mining crushers, such as jaw crushers, baffle crushers, vertical impact crushers, hydraulic cone crushers, ring hammer crushers, hammer crushers, roll crushers, compound crushers, cone crushers, two-stage crushers, gyrotary crushers, and mobile crushers, etc. The tenet of our company is "credit first,quality first and service first". New and regular friends from anywhere at home and aboard are welcomed to establish friendly cooperation partner relationship with our compay on long term basis. Feed type Low hardness minerals like lead powder,sliding powder,rare earth,hardening soil,earthenware clay,coal,etc.